Be sure the steak is close to room temperature before cooking. This tempers the meat and will ensure even cooking temps all the way through. 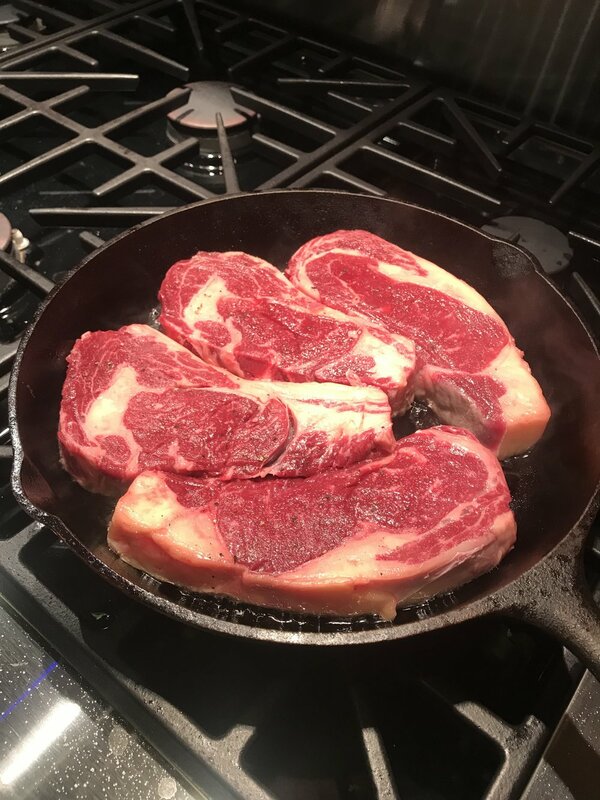 Over high heat, heat up a cast iron pan big enough for the steak. Add in oil once pan is very hot, oil should begin to smoke a little. Season steak generously with salt and pepper. Place into pan and let cook on one side for 2-3 mins. Turn in pan and place butter and thyme on top of the cooked side of the steak. Place cast iron into the oven for 5-8 minutes. Once internal temperature is 115 remove the steak and pan from the oven. Take steak out of the pan and let rest for 10 minutes on a cutting board. Reserve pan drippings for bordelaise sauce if desired (recipe below). Once the steak has rested, you can serve as is or slice up and plate with favorite sides. Chef recommends crispy fingerling potatoes. Lace the wine in a saucepan and reduce by 3/4. Add, shallots, peppercorns, bay leaf, thyme and demi-glace. Simmer for 15 to 20 minutes and strain. Stir in 2 ounces of butter.